Die Lunæ, 23 Januarii, 1642. St. Giles in the Fields Minister. St. Martin's in the Vintrey Minister. St. Albon's Woodstreet, Minister, &c.
Ordered, That the Lords be moved to join herein. Sir Gilbert Gerard reports from the Committee to consider of plundered Ministers, and sequestring the Livings of scandalous Ministers, the State of the Business concerning Dr. Heywood; and the Proof of the Matters against him: Whereupon. 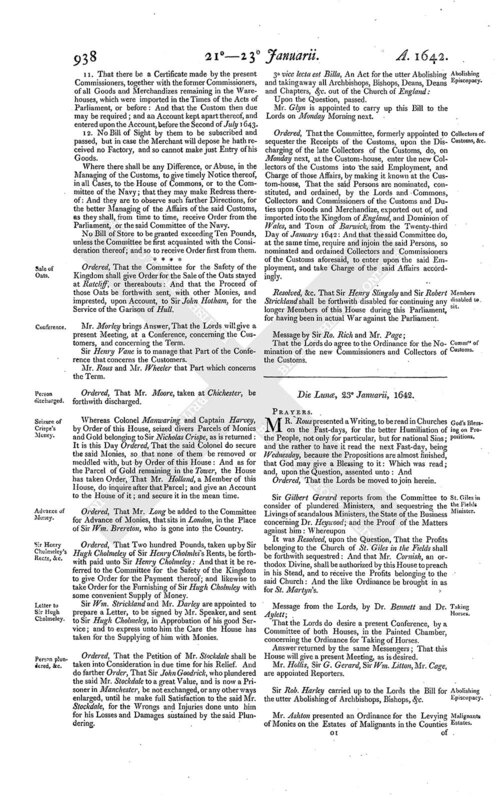 It was Resolved, upon the Question, That the Profits belonging to the Church of St. Giles in the Fields shall be forthwith sequestred: And that Mr.Cornish, an orthodox Divine, shall be authorized by this House to preach in his Stead, and to receive the Profits belonging to the said Church: And the like Ordinance be brought in as for St. Martyn's. That the Lords do desire a present Conference, by a Committee of both Houses, in the Painted Chamber, concerning the Ordinance for Taking of Horses. Answer returned by the same Messengers; That this House will give a present Meeting, as is desired. Mr. Hollis, Sir G. Gerard, Sir Wm. Litton, Mr. Cage, are appointed Reporters. Sir Rob. Harley carried up to the Lords the Bill for the utter Abolishing of Archbishops, Bishops, &c.
Mr. Ashton presented an Ordinance for the Levying of Monies on the Estates of Malignants in the Counties of Lancaster: Which was read; and, upon the Question, assented unto: And that the Lords be moved to join herein. Mr. Hollis reports from the Conference, That the Lords have Information, That the Ordinance, which passed both Houses, for the Taking of Horses, is become a great Burthen to the Subjects well-affected to the Parliament: And therefore desire this House to consider of the Order formerly sent down, that some speedy Course may be taken herein. Ordered, That the Consideration of this Report, and the Order, formerly sent down by the Lords, concerning Horses, shall be referred to the Committee appointed to consider of the Discharge of Horses: And are speedily to deliver their Opinions thereof unto this House. Ordered, That Sir Rob. Harley do bring in an Order, To-morrow Morning, concerning the freeing the Scholars in the University of Cambridge from being compelled to observe Ceremonies: And the like for Cathedrals. Ordered, That Sir Ben. Ailett High Sheriff of the County of Essex, Mr. Platers High Sheriff of the County of Suffolk, and Mr. Rose High Sheriff of the County of Cambridge, shall be forthwith summoned to attend this House; and to bring with them their several Commissions of Sheriffalty. Ordered, That Mr. Serjeant Wilde do bring in a Declaration concerning the Sheriffs: And also a Declaration, concerning the King's Letter to several Sheriffs, to receive the Monies upon the Bill of Four hundred thousand Pounds. It was Resolved, upon the Question, That the Profits belonging to the Parish. Church of St. Martin's in the Vintrey shall be forthwith sequestred: And that Mr. Salloway, an orthodox Divine, shall be appointed to supply the Place of a Preacher to the said Parish, instead of Dr. Reeve; and to receive the Profits belonging to that Church. Resolved, &c. That the Profits belonging to the Parish Church of St. Andrewe's Wardropp shall be forthwith sequestred: and that Mr. Mockett, an orthodox Divine, shall be appointed to supply the Place of a Preacher to the said Parish, instead of Dr. Isaackson; and to receive the Profits belonging to that Church. Resolved, &c. That the Profits belonging to the Parish Church of St. Albon's, Woodstreet, shall be forthwith sequestred: And that Mr. Fisher, an orthodox Divine, be appointed to preach there to the Parishioners, in the Stead and Place of Dr. Watts; and to receive the Profits thereof. Ordered, That Mr. Harris do, notwithstanding, continue Lecturer in St. Albon's Woodstreet. Ordered, That Geo. Druell, Prisoner in the Marshallsea, be removed from thence to the Prison at the Lord Pet. . . House; there to remain close Prisoner; having writ a Letter of Concernment, discovering his Intentions to escape. Ordered, That Captain Ogleby and Captain Carter, Prisoners that escaped out of Winchester House, be committed close Prisoners to the Lord Peter his House. Resolved, &c. That this House doth declare, That the Committee for Examinations has Power by the Ordinance to commit Persons to such Prisons as they shall think fit. Resolved, &c. That Mr. Spike, Mr. Pynder, Mr. Tombes, Mr. Lane, and Mr. Langhorne, shall be discharged, according to the Order of the Committee for Monies in London. Ordered, That the Committee for Monies in London do consider of the Petition of Tho. Squire; and of his Releasement, if they find Cause for it. Ordered, That a List of the Names be presented to this House, by Mr. Strode, of such Members as have promised to subscribe upon the late Contribution, and have not performed it. Ordered, That Captain James Chudley do require of, and receive of Mr. Peircy Edgecombe, or out of his Estate, the Sum of One thousand Pounds, assessed upon him by this House; and of Sir Tho. Heale the Sum of Two hundred Pounds, likewise assessed upon him by this House; and to be accountable to this House for the same. Resolved, &c. That these French Reformadoes Officers shall be discharged: And that it be left to the Lord General, if he think fit to employ them. Ordered, That the Three hundred Pounds remaining in Colonel Manwaring's Hand, belonging to Sir Nic. Crispe, shall be forthwith paid to Sir Hen. Vaine, Treasurer of the Navy, upon Account. It is Ordered, That the Committees of the County of Devon do pay the Sum of Two hundred Pounds to the Mayor of Barnstable, to be employed by him for the Defence of that Palce. The Order for enabling the Inhabitants of Lynne to keep sufficient Guards was read; and, upon the Question, assented unto. Ordered, That the said Officers mentioned in the List shall be entertained into Reformado Pay. 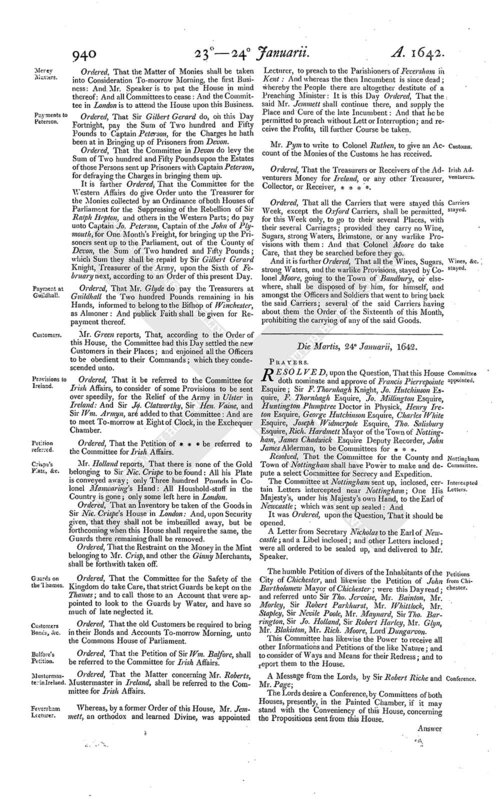 Resolved, &c. That the Committee for the Safety of the Kingdom do grant their Warrant to the Treasurer at Wars, to pay to Mr. Hollis Two hundred and Fortyeight Pounds Fourteen Shillings and Six Pence: And also the Sum of Twelve Pounds Two Shillings, according to the Certificate of the Auditor of the Army; there being so much Arrear unto him. 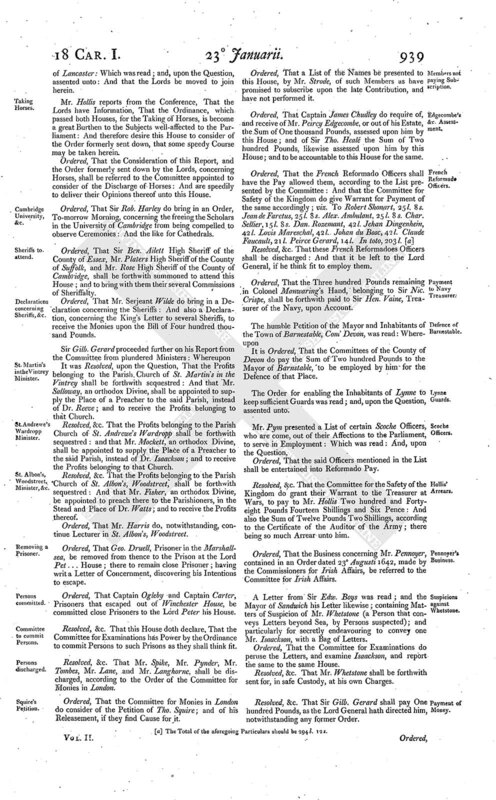 Ordered, That the Business concerning Mr. Pennoyer, contained in an Order dated 23° Augusti 1642, made by the Commissioners for Irish Affairs, be referred to the Committee for Irish Affairs. Ordered, That the Committee for Examinations do peruse the Letters, and examine Isaackson, and report the same to the same House. Resolved, &c. That Mr. Whetstone shall be forthwith sent for, in safe Custody, at his own Charges. Resolved, &c. That Sir Gilb. Gerard shall pay One hundred Pounds, as the Lord General hath directed him, notwithstanding any former Order. [a] The Total of the aforegoing Particulars should be 294 l. 12s. Ordered, That the Matters of Monies shall be taken into Consideration To-morrow Morning, the first Business: And Mr. Speaker is to put the House in mind thereof: And all Committees to cease: And the Committee in London is to attend the House upon this Business. Ordered, That Sir Gilbert Gerard do, on this Day Fortnight, pay the Sum of Two hundred and Fifty Pounds to Captain Peterson, for the Charges he hath been at in Bringing up of Prisoners from Devon. Ordered, That the Committee in Devon do levy the Sum of Two hundred and Fifty Pounds upon the Estates of those Persons sent up Prisoners with Captain Peterson, for defraying the Charges in bringing them up. It is farther Ordered, That the Committee for the Western Affairs do give Order unto the Treasurer for the Monies collected by an Ordinance of both Houses of Parliament for the Suppressing of the Rebellion of Sir Ralph Hepton, and others in the Western Parts; do pay unto Captain Jo. Peterson, Captain of the John of Plymouth, for One Month's Freight, for bringing up the Prisoners sent up to the Parliament, out of the County of Decon, the Sum of Two hundred and Fifty Pounds; which Sum they shall be repaid by Sir Gilbert Gerard Knight, Treasurer of the Army, upon the Sixth of February next, according to an Order of this present Day. Ordered, That Mr. Glyde do pay the Treasurers at Guildhall the Two hundred Pounds remaining in his Hands, informed to belong to the Bifhop of Winchester, as Almoner: And publick Faith shall be given for Repayment thereof. Mr. Green reports, That, according to the Order of this House, the Committee had this Day settled the new Customers in their Places; and enjoined all the Officers to be obedient to their Commands; which they condescended unto. Ordered, That it be referred to the Committee for Irish Affairs, to consider of some Provisions to be sent over speedily, for the Relief of the Army in Ulster in Ireland: And Sir Jo. Clatworthy, Sir Hen. Vaine, and Sir Wm. Armyn, are added to that Committee: And are to meet To-morrow at Eight of Clock, in the Exchequer Chamber. Ordered, That the Petition of * * * be referred to the Committee for Irish Affairs. Mr. Holland reports, That there is none of the Gold belonging to Sir Nic. Crispe to be found: All his Plate is conveyed away; only Three hundred Pounds in Colonel Manwaring's Hand: All Houshold-stuff in the Country is gone; only some left here in London. Ordered, That an Inventory be taken of the Goods in Sir Nic. Crispe's House in London: And, upon Security given, that they shall not be imbezilled away, but be forthcoming when this House shall require the same, the Guards there remaining shall be removed. Ordered, That the Restraint on the Money in the Mint belonging to Mr. Crisp, and other the Ginny Merchants, shall be forthwith taken off. Ordered, That the Committee for the Safety of the Kingdom do take Care, that strict Guards be kept on the Thames; and to call those to an Account that were appointed to look to the Guards by Water, and have so much of late neglected it. Ordered, That the old Customers be required to bring in their Bonds and Accounts To-morrow Morning, unto the Commons House of Parliament. Ordered, That the Petition of Sir Wm. Balfore, shall be referred to the Committee for Irish Affairs. Ordered, That the Matter concerning Mr. Roberts, Mustermaster in Ireland, shall be referred to the Committee for Irish Affairs. Whereas, by a former Order of this House, Mr. Jemmett, an orthodox and learned Divine, was appointed Lecturer, to Preach to the Parishioners of Feversham in Kent: And whereas the then Incumbent is since dead; whereby the People there are altogether destitute of a Preaching Minister: It is this Day Ordered, That the said Mr. Jemmett shall continue there, and supply the Place and Cure of the late Incumbent: And that he be permitted to preach without Lett or Interruption; and receive the Profits, till further Course be taken. Mr. Pym to write to Colonel Ruthen, to give an Account of the Monies of the Customs he has received. Ordered, That the Treasurers or Receivers of the Adventurers Money for Ireland, or any other Treasurer, Collector, or Receiver, * * * *. Ordered, That all the Carriers that were stayed this Week, except the Oxford Carriers, shall be permitted, for this Week only, to go to their several Places, with their several Carriages; provided they carry no Wine, Sugars, strong Waters, Brimstone, or any warlike Provisions with them: And that Colonel Moore do take Care, that they be searched before they go. And it is further Ordered, That all the Wines, Sugars, strong Waters, and the warlike Provisions, stayed by Colonel Moore, going to the Town of Bandbury, or elsewhere, shall be disposed of by him, for himself, and amongst the Officers and Soldiers that went to bring back the said Carriers; several of the said Carriers having about them the Order of the Sixteenth of this Month, prohibiting the carrying of any of the said Goods.